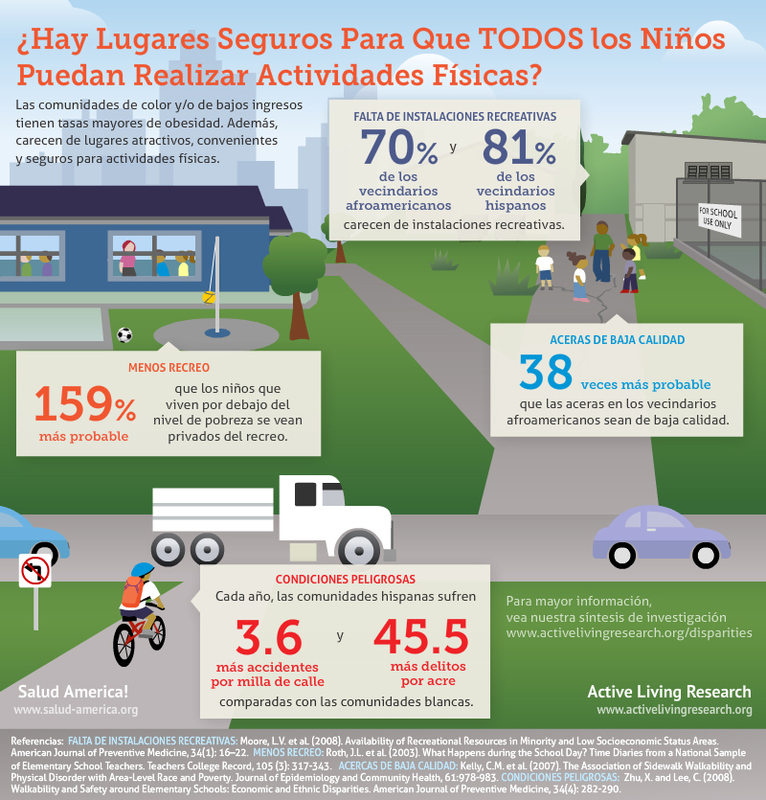 Infographic: Hay Lugares Seguros Para Que Todos los Ninos Puedan Realizar Actividades Fisicas? Our popular Do All Kids Have Safe Places to Be Active? infographic has now been translated into Spanish. We are happy to co-brand this infographic with Salud America! Children living in poor or predominantly minority neighborhoods are less likely to have clean, safe, and attractive places to be physically active. They are also at higher risk for obesity, overweight, and related health problems. This infographic features evidence on several barriers some kids face in being able to walk, bike, or play in their schools and neighborhoods. Barriers include a lack of recreational facilities, broken or uneven sidewalks, inadequate time for recess, and higher rates of automobile crashes and crime. Fortunately, all of these problems can be addressed with better policies, infrastructure improvements, and planning that can make neighborhoods safer, cleaner, and better designed for walking, biking, and playing. Use this evidence to make the case for improving your own communities. Findings presented in this infographic come from a related ALR research synthesis. This infographic can be downloaded for free in JPG format (453 KB) by clicking on the image or the "Download Original" link. A high resolution PDF version (6.53 MB) of this infographic is also available upon request. When requesting, please let us know how you intend to use the infographic.